In one of Trump's twitter revelations last week he called for the world to recognize Israel's sovereignty over the Golan Heights, in a direct violation of International law. A law that the United States has upheld for 52 years was suddenly challenged by Trump's stupid tweet. By just suggesting the idea he handed Israel's embattled leader an election day gift. 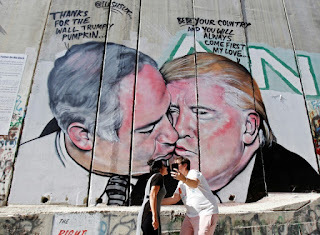 It was a case of birds of a feather sticking together; our corrupt president, who's under investigation for numerous crimes, is helping out Netanyahu who is also under investigation for corruption and abuse of power. That same tweet is also going to produce an opening for Russia's Vladimir Putin by undermining international condemnation of Russia's seizure and annexation of Crimea. And the tweet keeps on giving as China will hop on the bandwagon and apply it to the South China Sea. Nothing official has been passed since his mindless tweet. Trump and Netanyahu got a chance to hug and compare crimes yesterday at The White House, but no announcement on an official policy had surfaced yet.